The business blog network, Know More Media, has become a media partner and sponsor of the Blogworld & New Media Expo 2008 in Las Vegas, Sep 20-21. We are very pleased to be playing a part in this year's Blogworld, and hope to see many people there. 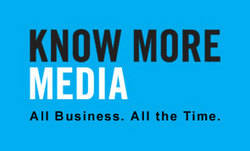 Know More Media, an online publisher of business content, and one of the world's leading business blog networks, has become a media partner and sponsor of the second annual Blogworld & New Media Expo being held at the Las Vegas Convention Center on Sep 20-21, 2008. Know More Media's business blogs provide real-time news, information, and analysis on a variety of business topics, authored by topical experts who are authorities in their respective business-related fields. The Blogworld Expo is the world's largest industry-wide tradeshow, conference, and media event that is dedicated to the blogging industry and new media. "We were proud to sponsor Blogworld at its inaugural event in 2007, and we are thrilled to be involved as a sponsor again in 2008," said Hal Halladay, CEO of Know More Media. "As a media partner, we are advertising and promoting the Blogworld Expo across our entire network of over 100 business-related blogs." In addition to Know More Media's sponsorship, other sponsors of the Blogworld Expo 2008 include Southwest Airlines, b5media, Townhall.com, Pajamas Media, PRWeb, TechSmith, Mashable, Technorati, Newstex, Sitemeter, and more. The event will feature a large industry-wide exhibition for the many vendors, blog networks, and businesses attending the conference. Exhibitors include such companies as b5media, Newstex, Technorati, BlogCritics.org, Townhall.com, GodblogCon, and Military.com. The Blogworld Expo will provide over 50 seminars, panel discussions, keynote speeches, and classes by the major companies and personalities on the leading edge of online technology and Internet-savvy business. "Blogworld proved to be a very enjoyable and valuable event last year," said Dan Smith, General Manager of Know More Media. "We are very pleased to be playing a part in this year's Blogworld, and hope to see many people there." Blogworld 2008 details and registration information can be found at http://www.BlogworldExpo.com. Know More Media (http://www.KnowMoreMedia.com) is an online publisher of business information and news, and is headquartered in Orange County, CA. Led by a team of seasoned business executives with many years of online publishing and business management experience, Know More Media is a revolutionary departure from traditional business publishing. The Company contracts with expert writers from across the globe to supply valuable business-related blog content to the online world. Its authors are typically practicing authorities in their fields, who provide their business advice and knowledge to business readers through a blog. Readers are encouraged to participate through comments and continuous feedback, thereby not only learning, but sharing their valued experience to an ever-expanding community of business expertise. Blogworld & New Media Expo 2008The Blogworld Expo 2008 takes place Sep 20-21 in Las Vegas, and Know More Media is a sponsor and media partner of the event.